On Friday, 11th of August, 2017, IPOB Aba zone took the message of "No Elections In Biafra Land until date for Biafra Referendum is fixed" to the home town of the state governor, Dr. Okezie Ikpeazu. All the IPOB units in the zone took off from their different locations and converged at Obingwa in Abia state. They were seen marching in their thousands with Biafra insignias: flags, caps, mufflers, T-shirts, shoes; keeping people aware of the order given by the leader of Indigenous People of Biafra (IPOB), Mazi Nnamdi Kanu, to boycott elections in Biafra land until a date is fixed by the federal government of Nigeria for Biafra Referendum. The rally was an atmosphere of jubilation where IPOB members were singing songs of Biafra and songs of freedom. 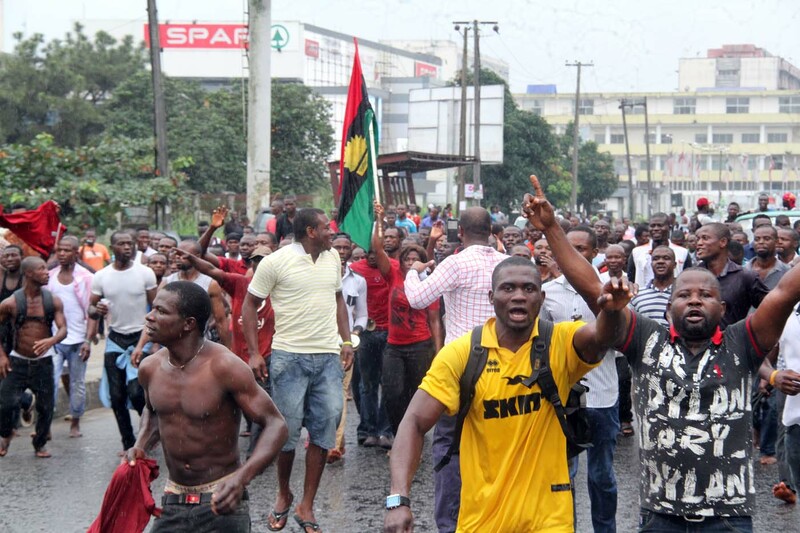 "How many Biafrans Buhari go kill? How many Biafrans Buhari go kill? Oh he go kill us tire! Oh una go kill us tire oo! Oh oh oh them go kill us tire! How many Biafrans Buhari go kill?" The officers were stuck at their position with that song, so confused and weakened. Meanwhile, one of the leaders identified as Mazi Patrick in the rally spoke to an IPOB Writers reporter on the reason why Obingwa was chosen to be the first place to be stormed with the message, he said "Obingwa is the hometown of the Executive Governor of Abia State, Dr. Okezie Ikpeazu who unfortunately happens to be an opposer of Biafra. We want him and his masters to know that there is no going back on the election boycott. We want to tell him that we are formidable". Recall that the leader of Indigenous People of Biafra (IPOB), Mazi Nnamdi Kanu who leads the struggle for the Restoration of Biafra, while still in unlawful detention in Nigeria's gulag, ordered a Sit-at-Home exercise to honour Biafra Fallen Heroes, which went successfully and subsequently has ordered that there will be no election in Biafra territories until a date for REFERENDUM is fixed for Biafrans to display their resolve to exit the oppressive Nigerian state. And they are going to use Anambra State election coming up on 18th Nov, 2017, as a litmus test for 2019 general elections in Nigeria. Moreover, according to the law, Mazi Kanu has hinted that the House Speaker, at the event of a successful election boycott, will take over the governance of Anambra in an interim status.